With spring in full effect, it’s time to say goodbye to your hermit lifestyle and welcome in that vitamin D (just don’t forget the sunscreen). 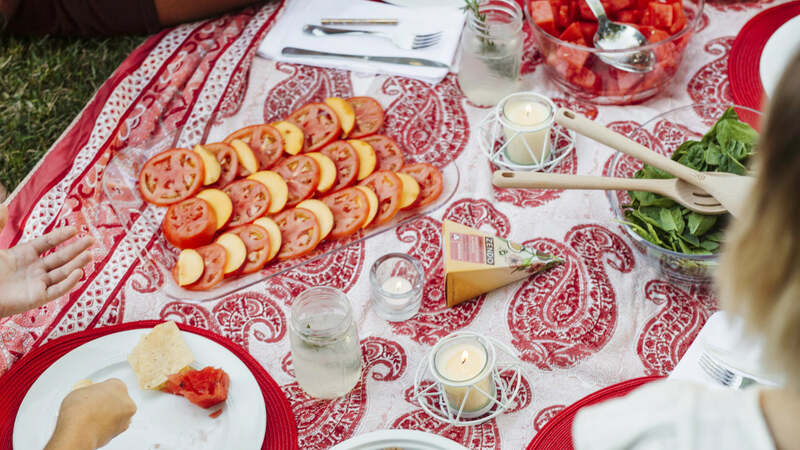 Dust off that picnic basket in the back of your closet—one of those blue Ikea bags works, too—and make some plans to enjoy the sun with friends by planning a pot-themed picnic! Whether you’re heading to your local park or spending a day at the beach, a picnic with pals can be improved by cannabis tremendously. All you need are the essentials: weed-infused snacks, refreshing beverages, and maybe a little bit of flower, so you can sit back and relax with your loved ones outside for a few hours. 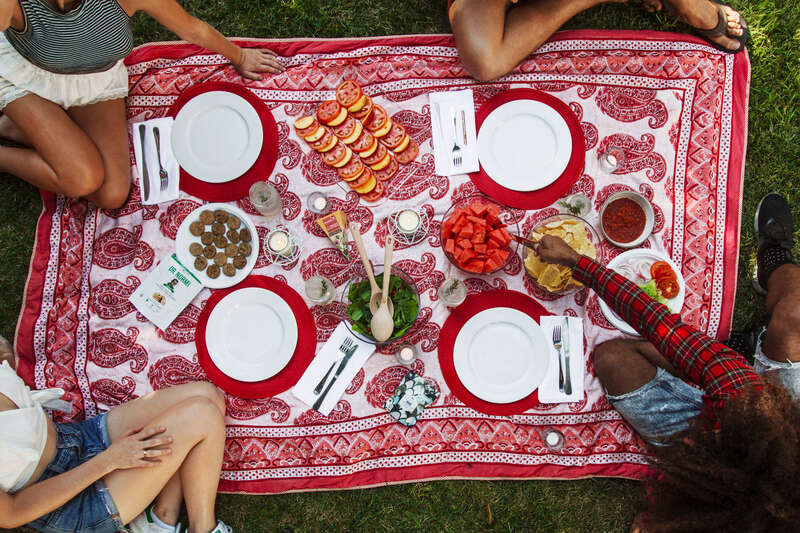 Here, we’ll give you tips on how to infuse your favorite picnic foods with cannabis, plus recommendations on edibles, beverages, and more. Before you plan your snack spread, make sure to pack practical items like a blanket, cups, paper plates, napkins, trash bags, sunscreen, a big blanket or towel—and a large umbrella if you’re going to be out in the sun. Cannabis edibles are perfect for a daytime picnic (and nighttime too, of course). Shop your nearest MedMen and pick up an assortment of tasty snacks such as Kiva Terra Bites, Dr. Norm’s cookies, and Smokiez Fruit Chews. Forgo the champagne and sparkling fruit juice and opt for something a little more interesting for your beverage offerings. Mood33 Tonicis a THC-infused, low-calorie beverage brand that will help quench your thirst under the sun. Choose from drinks like the indica Calm, the sativa Joy, or the hybrid Passion, which contains 10 mg THC and 2.5 mg CBD. Why not pick up some potent plant provisions for your spread? Make things easy by bringing a pack of pre-rolls from Old Pal for you and your companions to enjoy (in a discreet place, of course). If you have a go-to picnic food, you can elevate your culinary expertise by infusing it with something a little more potent than pepper. By adding a bit of canna-oil, your recipe will be instantly transformed into an edible and you can call yourself a cannabis chef. Whether you’re making potato salad or hummus, this recipe for cannabis-infused oil is sure to make things more interesting. Step 1: Decarboxylate the flower to convert the THCA into THC. Preheat oven to 225 degrees F. Spread the cannabis evenly on an oven-safe tray and let cook for 30–35 minutes. Every 10 minutes, stir cannabis to ensure it cooks evenly on all sides. Step 2: After 30–35 minutes—once the cannabis turns from a green to a light to medium brown color—remove from oven and let cool. Step 3: Grind your flower. Step 4: Place the cannabis in a saucepan with the coconut oil (or olive oil), over a low flame. Let simmer for 10 to 15 minutes, stirring frequently. Remove from heat. Step 5: Strain the cannabis mixture through a cheesecloth or strainer. Store oil in an airtight container and use within three months. Add a tablespoon or two to homemade hummus or potato salad, and enjoy!